Boston Bombing Defendant Can See Victims' Autopsy Photos, Judge Says : The Two-Way Prosecutors said it would disturb the families of those who died to know that Dzhokhar Tsarnaev could view those images. The judge ruled Tsarnaev has the right to see such evidence. 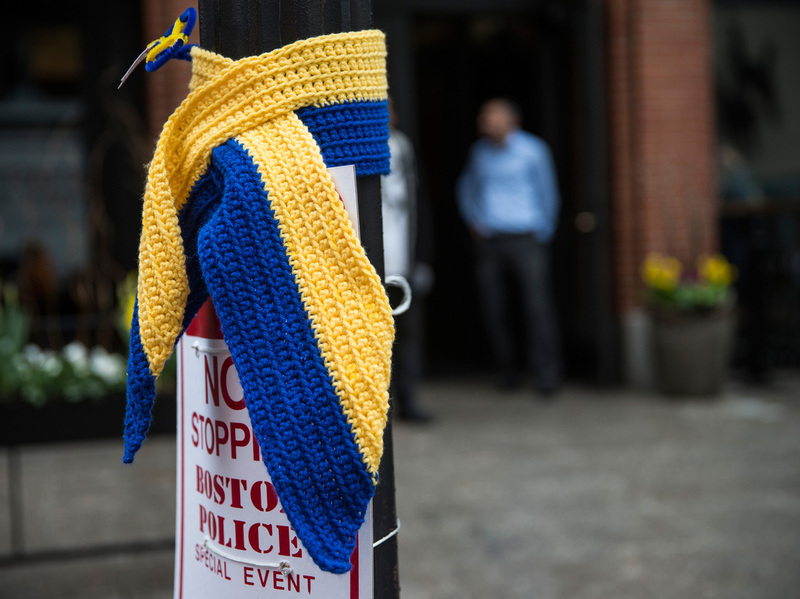 Blue and yellow are the colors for tributes to victims of the Boston Marathon. Street lights on the route of this year's race are among the places they're showing up. A federal judge said Wednesday that Boston Marathon bombings suspect Dzhokhar Tsarnaev may see autopsy photos of the three people who died after the explosions near the finish line of last year's race. "Under court rules, lawyers for Tsarnaev are allowed to see the photos as they prepare a defense. The government sought a special restriction — that Tsarnaev himself not be allowed to see them unless the government offered them as evidence at trial. "The defense lawyers said they had never heard of such a restriction, and that decisions about what Tsarnaev can and can't see are best left to his lawyers." O'Toole denied the defense lawyers' request, however, that some of the charges against Tsarnaev be dismissed. New England's NECN.com writes that the attorneys had argued that "many of the charges in the 30-count indictment Tsarnaev is facing are redundant." It was one year ago April 15 that the two bombs went off. During the four-day hunt for the bombers, an MIT campus police officer was killed. Tsarnaev's older brother, Tamerlan, died after a gunbattle with police in the Boston suburb of Watertown, Mass. Dzhokhar Tsarnaev, now 20, was captured in Watertown last April 19. His trial is expected to begin in November. Also of note: Running Toward Boston, an NPR Tumblr from eight people who are training for the race.